In spite of the style or age, chimney’s will probably at some point encounter degeneration which can bring about the necessity for chimney repair work and maintenance. Tiny occurrences, like, a bird nest in a chimney can create substantial damage which can eventually become really expensive. 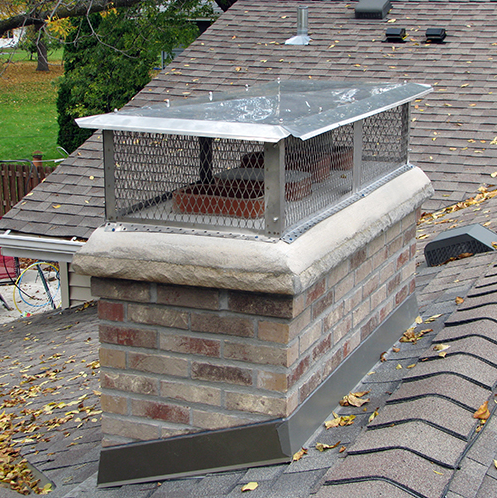 Dayco General offers every kind of chimney repair in Edina. Prior to looking at chimney repairs, it is critical to evaluate the structural form of the chimney as this is the foundation of the preliminary procedures. The brick and mortar should not allow rain or other elements to permeate the chimney’s composite structure. Deterioration to chimneys can possibly be brought on by a number of factors. Nevertheless, the scope and size of repairs is most normally a factor of the age of the structure but can also be brought on by severe weather (falling tree limbs or lightning strikes) or a chimney fire. Problems due to deteriorating mortar, excess moisture within the chimney, or a chimney fire will weaken clay tile liners and the brick, it is vital that chimneys are inspected from time to time. The Chimney Safety Institute of America recommends yearly chimney inspection. In the Twin Cities Metro area our excessive freeze/thaw cycle, adds even more weight to the necessity for routine inspections. Expert repairs are needed when you feel that the scope of the deterioration is above and beyond what you can easily handle. Inspection by our CSIA certified experts will supply you with a report which offers correct maintenance procedures. Swollen bricks or swollen mortar joints can cause the chimney to lean and lose its stability. Masonry swelling results from age and water leaks in the structure. Both brick and mortar are relatively water resistant when they are brand-new, but without the routine service treatment of a waterproofing sealant, this quality is gradually lost with time. Because of this, toward the end of the mortar life-span, the moisture absorbency of the masonry raises considerably. This often leads to rapid expansion damage during the freeze/thaw. Older brick and mortar that has been through many freeze/thaw cycles, notably on chimneys that have a leaking cap that has allowed water to both the interior and exterior of a wall, can swell noticeably causing an observable (sometimes unsafe) lean as time goes by. Remarkably, a chimney that leans due to this process will often tip away from the sun. In the Northern hemisphere this means an older chimney with severe freeze/thaw expansion damage will lean toward the North because the sunny side will have a broader depth of temperature variation and a lot more frequent fluctuations in the freeze/thaw phenomena. We have seen tall chimneys that were leaning so precariously that we strongly recommended non-occupancy of areas below the hinge point of the chimney until repairs could be made. When it comes to chimney repair in Edina, we have seen chimneys totally fall to the ground, which requires removal and replacement. All these maintenance tasks will require expertise. The sad thing is, in these cases, there is no convenient alternative for chimney repair except to replace the broken bricks. Brick replacement and tuckpointing should only be done by a professional tradesman. We see damaged home facades constantly where an inexperienced person attempted tuckpointing only to do permanent harm to the brick appearance by smearing mortar outside the joints. Tuckpointing is among the trades that has a very high learning curve and a lot of expertise is required to turn out a nice-looking project that will last a very long time. Regardless of many essential preventative measures, if you find any cracks, signs of degeneration, crumbling mortar in the chimney, it is time to get in touch with our pros here at Dayco General for a chimney inspection to confirm the well-being of your home. Ignoring masonry chimney issues may possibly be downright costly and dangerous for your family. and insured. (License # BC266544).